I’m excited to officially be opening the web app I’ve been building, GoalChamp, to the public. GoalChamp’s mission is to help you track and achieve your goals. Lots of people set goals or have New Years resolutions, but there isn’t a great way to track them. 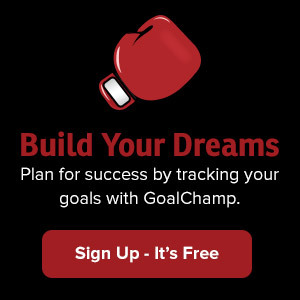 I found the same issue in tracking my own goals and that is why I created GoalChamp. I never used to track goals. Instead I’d just live day-to-day and take whatever opportunities came to me and run with them. After college I was freelancing and wasn’t sure exactly what I wanted to do next, so I decided to try setting some goals. I wrote those goals in a notebook, for lack of a better place to put them, and over time found myself accomplishing a lot of them. Just that process of writing them down helped me focus on what I wanted and quickly identify opportunities that would help me get there. After awhile, I realized I hadn’t set any new goals and had no idea where that notebook had gotten to. I wanted somewhere that I could more easily track my goals, but wasn’t able to find a solution. There were print out templates and to-do lists that didn’t really fit the goal setting process. That led me to decide I should take a shot at creating a system that would help me and hopefully others as well. Once you sign up, you’ll be ready to add your goals. Currently, those goals are grouped into 1, 2, 5 and 10 year groups. When you click the button to add your first goal, you’ll be guided through 3 simple steps to create a goal. Each step has some helpful tips for creating effective goals. Once you’ve added some goals you’ll be able to open up GoalChamp anytime to do a review of your current goals to keep them fresh in your mind. Doing this often (I recommend in the morning or before bed) will help you see opportunities in your daily life that will move you closer to achievement. 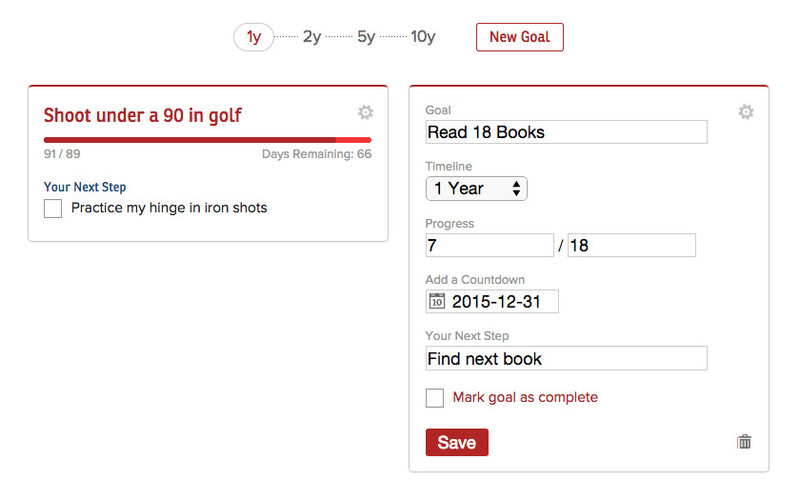 You can also update your existing goals to track your progress using a counter (e.g. 1 out of 10) and view the amount of time left that you’ve targeted to complete the goal. You can add a to-do item that will be your next step to focus on in achieving your goal. All you need is an email to setup a GoalChamp account (yes, it’s free). I hope you’ll sign up and give it a try. Let me know what you think, if it helps in reaching your goals, and if you have any suggestions. Also check back here on the blog where I’ll be writing some helpful articles on goal setting, goal tracking and (most importantly) achieving. Create a GoalChamp Account Here!